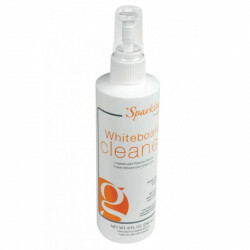 Sparkleen Markerboard Cleaners formula is so effective it even removes most permanent inks. Made with the Best Quality Material with your child in mind. Ghents Sparkleen is specially formulated to cut through built-up residue faster and easier than any other markerboard cleaner on the market. The non-flammable Sparkleen conditions the markerboard surface as it cleans and removes hidden ink particles from the surface, helping to restore the board to like-new condition.